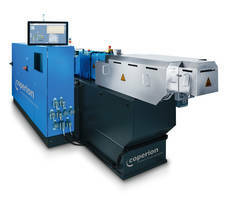 PITMAN, NJ US – K-Tron formally announces joint exhibition with Coperion at Feiplastic 2013, May 20-24, Anhembi Convention Center, Sao Pãulo, Brazil, Booth H100. Coperion has been appointed as the new representative for K-Tron in the market of Brazil. Booth will feature feeding, pneumatic conveying, extrusion, and systems engineered solutions for plastics processing applications including primary resin, compounding, extrusion, and related applications. For more information please visit www.ktron.com/feiplastic. The T35/S60 Quick Change Feeder is specially designed for applications requiring the maximum possible material handling and changeover flexibility along with the convenience of fast cleaning. 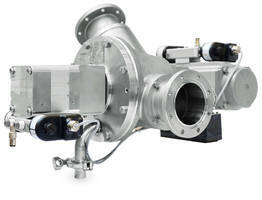 The feeder is available in volumetric or loss-in-weight configurations, both as single or twin screw. Single screw units handle free-flowing powders, granules, pellets and other non-flooding materials, while twin screw units control floodable powders and more difficult sticky or hard-to-flow materials. Typical Applications: Where frequent easy cleaning is required, where product contamination is not allowed, where only one feeder must handle a large variety of bulk materials, where ingredients must be changed quickly and cleanly. Designed to convey poor-flowing powders and fragile bulk materials, the P30 vacuum sequencing receiver offers various discharge valves, including power flap, butterfly valve or slide gate. Material conveying principle is pneumatic, as vacuum, dilute and dense phase. The conveying rates range up to 4,000 kg/hr (9,000 lbs/hr) on batch basis. Models include P10, P30 and P100. Typical Applications: Hopper loading, LIW feeder refill, and difficult conveying applications. 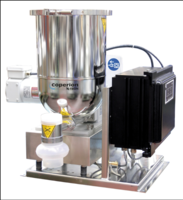 2400 Series Receivers: The 2415 vacuum sequencing central powder receiver is designed to handle fine bulk materials. The modular design allows flexibility in the selection of material construction, power, filtration and receiver inlet sections. The 2415 is available in two versions for either general "keep full" conveying or loss-in-weight feeder refill applications with a variety of discharge valve types including gravity, slide/orifice, and butterfly. Conveying rates range up to 1000 kg/hr (2200 lb.hr). Typical Applications: Railcar unloading, Silo-to-day bin transfer, in-plant transfer, LIW feeder refill.